The Keir Choreographic Award, biennial Australian prize, was launched in 2014, and was formed through a partnership between Carriageworks (Sydney), Dancehouse (Melbourne), and the Keir Foundation. We spoke to Amrita about her work, and reflections of her practice that talks to ideas of authenticity, culture and the perpetuation of cultural tradition. Congratulations on being selected as one of four finalists for the 2018 Keir Choreographic Award. How does it feel? Thank you – it’s a real honour to be selected especially as the calibre is high. The cut and transition from the semi-finals to finals felt really brutal, so it was a real privilege to be included. Can you tell us a bit about the work you have choreographed, A Caltex Spectrum? A Caltex Spectrum was spurred on by thinking about western imperialism and the many different roles it plays in dictating class systems and how very slippery and fallible it was when you took a good look at it. This lead to an interest in crude oil companies and the great open road, and ideas we spun about freedom and self-determination. I was also reading a bit of Singularities: Dance in the Age of Performance by André Lepecki and thinking about the labour of performers as inseparable, inside and outside of the studio or theatre, especially for performers of colour. As an artist, I’m interested in the dilemma of authenticity/originality and what we as humans will do to prove ourselves. One of these practices is the idea of code switching – to switch the way in which we communicate things in order to be heard – and within this work I was looking at how people code-switch in order to manipulate, survive or transcend class structures. Most of this research and thinking was used to devise the work. Within the work, performers use a motorbike as many things (a deity, prey, an obsession, a lover, a platform) and it in turn uses and galvanises them, and their movement. 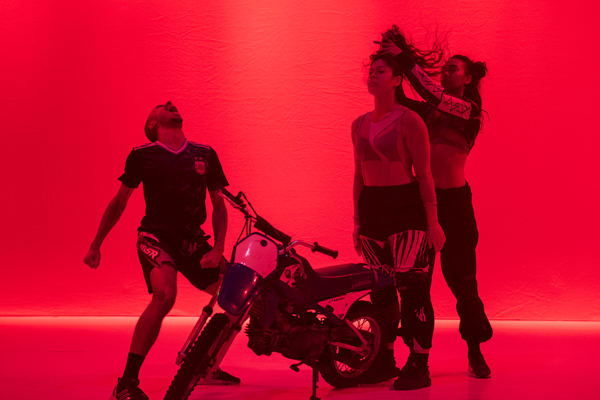 We get to see a switch happen around an object that’s inanimate, but like the dancers in this piece, they are all layered with certain unavoidable social inscriptions and so the motorbike as well as the movement becomes an allegory. Your exploration and idea of transcending class through movement is such a fascinating concept. How does this physically play out in the work? I knew that I was working specifically, with a very strong relationship to dances of social mobility within the context of Australia and the Pacific, and so I wanted to animate this as much as possible. That was a good starting point. I knew that I was trying to interrogate a certain type of body and a certain type of embodiment. I was trying to play also with duration, or at least with creating a relationship to time that had an articulation of memory, and the present, and a sort of posturing towards the future, sort of happening simultaneously. Physically my practice is very influenced by a broad array of physical components and thinking but is usually linked back to hip hop – which is interesting and not untrue but I would say maybe a bit reductive. What I am interested in as a maker is movement that is irreducible and holds a vibrancy, but maybe a touch of brutality to it. In your Ted X Youth@Sydney talk, you spoke about your belief that dance has the ability to “organise and effect time”. How do you think dance can achieve this? When we are dancing (or choreographing) we are organising space and time around us in a certain way whether we choose to see it this way or not. How it affects us (or the audience) is up to the makers/dancers/choreographer’s choices. I am looking forward to taking time off! I am working a lot with other companies such as Force Majeure doing the Commonwealth Games and Marrugeku. This year with Marrugeku I’ll be in their new work called Le denier Appel that will premiere, in Sydney at Carriageworks, then go on to Nouméa and Europe. I am also in the process of researching and making a new body of work and am taking time to do a residency in order to get deeper into it for 2019/2020. And potentially doing a Caltex Spectrum 2.0.